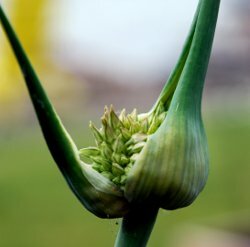 Elephant garlic flower bud on scape. Flowering plants, aka angiosperms, appeared on land 125-250 million years ago, depending on what fossil you are looking at, how you classify angiosperms, what author you are reading, and whether you have looked closely at that strange rock you picked up on vacation last summer. My elephant garlic is flowering now. 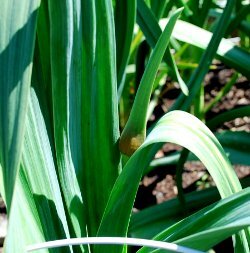 The flowering stalks are called “scapes.” According to The Free Dictionary a scape is “A leafless flower stalk growing directly from the ground, as in the tulip.” Elephant garlic scapes do not grow directly from the ground. They come from the top of the plant. But still, they are leafless. Another definition from the same source is “Variant of escape.” The scapes in my garden did not escape. I cut them off. Supposedly by removing the scapes, the garlic below ground will grow larger. Also, the scapes can be eaten. The flowers are used by florists. 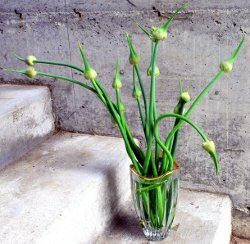 Thinking I would end up with a gorgeous bouquet of huge allium flowers, I cut off the tender bottoms of the scapes for cooking, and put the top scapes in a vase. That was a couple of days ago. I don’t think the flowers will open fully. Emerging scape on Elephant garlic. Elephant garlic is not really a garlic. It’s closer to a leek. The heads, which grow underground like true garlic, are very large, and, when fully formed, are made up of “cloves” just like true garlic. Somewhere I heard that the individual cloves in an elephant garlic head are called “toes.” The taste is milder than true garlic. And wonderful. Mine aren’t ready for harvest yet. 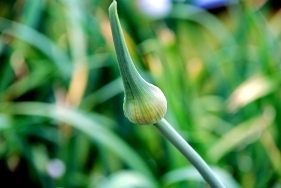 Growing elephant garlic is just like growing true garlic. Here in western Washington garlic is planted in the fall. We planted all the garlics and the elephant garlic on October 24 2008. Probably a little late. This crop looks like the best I’ve grown, probably because these garlics were planted in the very loose, compost-amended soil where last year’s potatoes grew. I applied three doses of liquid fish fertilizer, in February, March and April, and then kept things watered. I haven’t put my hand into the dirt to see if heads are developing. I’ll be soooo disappointed if all I get are scapes. These scapes are supposed to be very good for stir-fried dishes. I tried it, and discovered a couple of things. The tender part of the scape is the lower part, close to the plant. Higher up the scape the covering skin is tough. The older the scape, the more tender the lower part. Which seems contrary. Usually, young is tender. But the scapes with the tightest buds seemed to be the toughest. Go figure. I wonder if the buds in the vase will open. Somehow, I don’t think so. 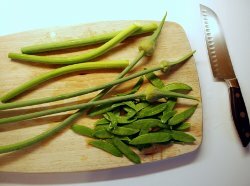 Here’s what I did with the edible tender parts of the scapes. They do not taste much like garlic. They are mild and have a distinctive flavor. 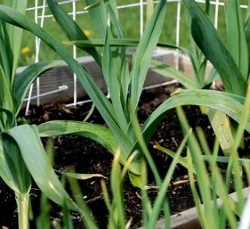 Use the lower tender part of the elephant garlic scape. Slice thinly on the diagonal. When slicing, start at the bottom of the scape. Then you can feel through the knife when you get to the tough part of the stem. 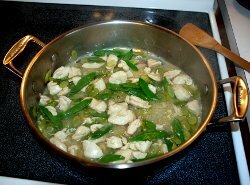 1/2 cup of any other stir-fry vege you have – celery, onion, sweet pepper, etc. Saute the scapes, garlic and hard veges until just starting to soften. Add meat, cook until just done. Pour in 1 cup water or chicken broth. When hot, thicken with a couple of teaspoons of cornstarch mixed with 1/4 cup cold water. Add peas and soft veges. Steam for 2 minutes. Serve over rice. Yum. You can also season with your favorite Thai seasoning blend.